August 14, 2017 – This week, our time machine travels back to the Gilded Age and pre-World War Two America, to hear the voices of those who held crowds enthralled. 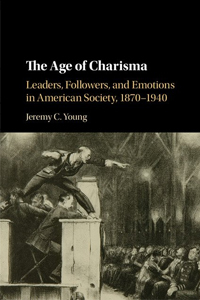 Our guide on this journey is Jeremy C. Young, and his book is, The Age of Charisma: Leaders, Followers, and Emotions in American Society, 1870–1940 . In it, Jeremy traces the modern relationship between leaders and supporters, back to a unique group of charismatic social movements prominent in the late-nineteenth and early-twentieth centuries. It was the age of magnetism, of dramatic gestures, of Christian revivals led by riveting preachers — and it laid the groundwork, for today’s mass media. Jeremy is Assistant Professor of History at Dixie State University in St. George, Utah. You have seen his editorials in many newspapers including the Chicago Sun-Times, San Francisco Chronicle, and Seattle Times. You can find him at JeremyCYoung.com, at @JeremyCYoung on Twitter, or Facebook.com/TheAgeOfCharisma.